This entry was posted on November 18, 2007 at 10:19 pm and is filed under Food for thought with tags questions. You can follow any responses to this entry through the RSS 2.0 feed. You can leave a response, or trackback from your own site. It is true, I am sushi challenged. hahah, I basically looked just like the kid in this pic! No strategery is necessary. Just say something like… I dare you to eat this. I mean it’s it kinda adorable to have your date struggle a little with some food. It’s a classic scenario to grow closer over a mistake… remember that pasta scene in Lady and the Tramp. This resturant sounds like fun for a first date, at least it won’t be boring and formal. This question can be easily answered. 1. Dip just the top of the cone in a lickle bit of (lite) soya. 2. Now you gotta go for it. This bite is key. You put the entire wide part of the cone into your mouth and bite down, eating the less filled part of the cone. 3. Now you’re left with a more densely packed more manageable mini-cone. Dip into soya, and enjoy slowly. If the sush is well made the rice should stick and the seaweed paper should hold it all together. This is all pretty simple. I must say though that “vegetarian” sushi is quite a cop out. I just call it rice and vegetables. 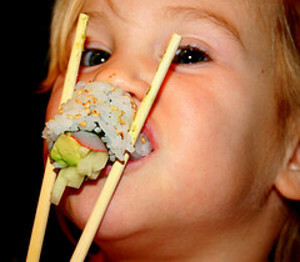 I must agree that vegetarian sushi is not quite the same. On our next sushi outing, I shall be slipping in some new “special” vegetables. I agree–this has been a big problem for me on outings past! My question is, why do the sushi places stuff the jumbo rolls so fat? Couldn’t they just spread out the fillings, admittedly raising the rice-to-filling ratio, so that this entire situation could be avoided? Does the jumbo roll have any basis in traditional japanese cuisine, or is it an americanization we could just as soon do without? If that’s the case, might as well us a knife and fork.